The boys have discovered Vitamin Water. You know, those 20oz. bottles filled with pastel-hued water, each flavor claiming to posess a different proprietary blend of nutrients, vitamins and anti-oxidants, without which your personal health will not be complete? They seem to be stacked near the checkout at every local grocery store and darn it, they're visually appealing. They have those simple, graphic labels and every bottle is a different shade of the rainbow, in a washed out, not totally Kool-Aid offensive way. And hey, did they mention it's good for you!? I believe the interest began at the holidays when a certain relative we were visiting, who shall not be named but shares a middle name with my oldest son, purchased some and shared with Andrew. It's good stuff. There's not much not to like. Then, over the course of the winter, I believe Andrew might have talked another relative he lives with, who shall not be named but has a first name that rhymes with Park, into purchasing it occasionally. The trouble is that the smallest person in our home has now discovered the merits of Vitamin Water and greatly enjoys the orange-flavored variety. (Andrew thinks he likes the red one, but since I won't allow red drinks in my house anymore, he has to like the Lemonade.) Aside from knowing that the vitamins and anti-oxidants and immune-boosting zinc are good for him, we've assumed that Thomas is so enamored by them because he simply likes drinking something that Andrew and daddy like. We went to the grocery store this afternoon and there they were, in all their technicolor glory right by the self-checkout. I should have said no, but it was dinnertime and everyone was hungry and tired and we're running on little sleep around here so I did the simple thing and let them each choose a bottle. We arrived home with our "juice!" and they obediently ran to the table to wait to be served. I opened each bottle and put them on the table while I went to grab cups for them. While I was across the kitchen, both boys grabbed their bottles and began drinking. This works for Andrew. For Thomas, this results in Vitamin Water all over his shirt and all over the table. It's akin to him drinking out of a fire hose, but this fire hose is serving up orange juice. This seemed like a logical time to pour some juice into the cup and offer it to each boy. Andrew, because he seems to have sporadic moments of maturity lately, took the cup with no complaint. Thomas, because he's two, took the cup and began screaming at me that he wanted the bottle and then poured the Vitamin Water I had offered all over the table - this time on purpose, just to illustrate his point. This is when we discovered that it's really the bottle he likes, not so much the Vitamin Water. After a series of negotiations and good behavior he got the bottle back in his paws and proceeded to down almost the entire thing. The rest is in the refrigerator where I have already added water to it and it's waiting for him to be delighted by it again tomorrow. I'm thinking I've purchsed my last Vitamin Water for a while because if he likes to drink out of a gallon jug, I don't need to spend $1.19 for him to do it! He started riding a two-wheeler last weekend but was a little tentative until today. It seems to have really clicked tonight. He did have a tumble on the driveway that required some attention but he didn't shed a single tear and wanted to go again. On the night he first rode without the training wheels, I told him I was so proud of him my heart just might explode. 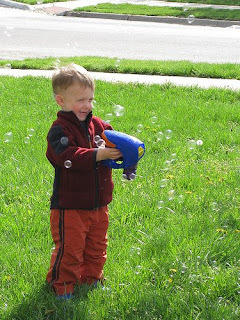 He beamed and then said, "Mommy, I'm that proud of me too!" He's also gearing up for basketball camp with daddy and he's been a practicing fool. We went to the Wards' for dinner on Saturday and Scooter gave him an official KU Camp Ball. To say he's delighted with it is an understatement and he's figured out how to shoot it without clunking himself in the face with it. Our neighbors are out-of-town and have a goal in their driveway so he has used it liberally this weekend. He's going to be disappointed to see them roll in next week. We're probably due to install one of our own, but we'll have to figure out how to clear some driveway space for the court! Both boys helped me collect trimmings from our shrubs this afternoon, by filling their little wheelbarrow SEVEN times and then dragging it into the garage to go in the trash can. Their work ethic exceeds mine! The other thing we've had a lot of this weekend is thunder and rain, and it always seems to start just after the boys go to bed. Young Thomas does NOT like thunder so another dominant theme in our weekend has been consoling him back to bed. It's just started again so I'm typing feverishly, hoping against hope that he'll tough it out tonight. It's a good thing he's so cute. We could certainly have worse 2 a.m. company. This picture truly is worth a thousand words! This is Andrew at 8:45 p.m. after an activity-packed Memorial Day weekend. I think this might sum up how we all feel tonight. 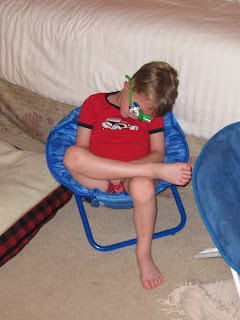 He fell asleep sitting up, wearing his new jammies and his new swim goggles. I got those off of him without waking him up because, well, I'm just that good. Mark updated the Flickr stream and as I was browsing through some recent pics, I thought that a few of them probably deserved a little narrative. Hope you enjoy! This is self-explanatory, but I love how it just embodies sheer delight! This is a glimpse into all the help that Mark had in fixing our storm-downed fence a couple of weeks ago. 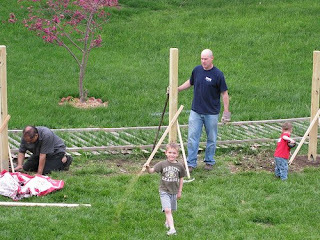 That's T on the right, manning the shovel, Andrew's in the middle running with a 2x4, and our neighbor on the left, joining Mark in his perfectionist tendencies as he hand packs dirt around a post. 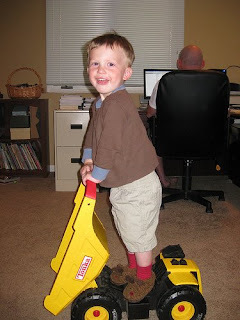 It's a good thing he's become accustomed to supervising teams of contractors. This is my Mother's Day. The boys were upstairs and it became ominously quiet. I yelled up to inquire about what was happening and Andrew responded by saying, "Mommy! You should come up and see what we've gotten into!" I grabbed the camera on my way up because I knew that it was going to be a sight. 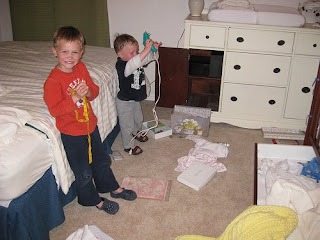 I had forgotten that I had a box of craft supplies in the dresser in Thomas' room and, well, they had found it. You'll notice T is doing a little work with a glue gun and Andrew's working on some important measuring. Thomas is developing a distinctive fashion sense. This outfit is entirely his doing. He favors neutrals and who says that you can't wear Rudolph slippers in May? I remember a time in my life during which, when with a group of friends, someone might have gotten the bright idea that it would be really funny to go ring peoples' doorbells and run. Tonight someone decided it would be hy-sterical to ring our doorbell a couple of times around 10 p.m. There is a long list of reasons why this isn't really all that entertaining to me these days. The least of these reasons is not that it wakes small children. You can add to the list that I wasn't really looking for an adrenaline rush this evening. It's funny how "funny" changes so dramatically over the course of 15 or 20 years. It's probably unrealistic to think that neither of my children will ever, on a warm spring night, decide to engage in a similar activity but I will remind them someday of how funny our family didn't find this tonight. I actually don't know anyone over the age of 15 who would find this activity entertaining and that probably includes the local police department. While I'm certain they have a number of more important things to do and what you did probably doesn't break a single law, I'm also sure that if there's a power-hungry police officer in the vicinity, he would be happy to drive around shining his little light in our local roundabouts. I'm getting old and grumpy and I've called them to report lesser offenses in the last year. I'm sure you can run really fast and you're probably pretty good at hiding in your neighbors' landscaping. But, just for fun, if you ring my doorbell after dark again for no good reason, I think I'll give them a call and see if you enjoy a good adrenaline rush as much as you probably think you would. p.s. If you're the same kids who thought it would also be funny to rifle through the cars parked in the driveway last week, I hope you're enjoying your iPod transmitter and next time, please take the Jeep. I'm one of those suckers in the grocery store checkout who is enticed to purchase new flavors of chewing gum. You know, Strawberry Kiwi!, Polar Burst!, Cinnamint! The boys and I just returned from Wal-Mart and I think I owe it to the internet to alert you to the following: Orbit Sangria Fresca!, does not taste like Sangria or Fresca. Grandpa and Grandma returned from their world travels yesterday. Our boys, as well as us, were delighted to see them today when they dropped by for a late-afternoon visit. While they would have been happy to see them regardless, they were especially interested in opening the gifts that they brought. Andrew received a chess set that he loves, as he fancies himself a regular Bobby Fischer these days. It's a beautiful wood and leather travel set and the game pieces are Chinese emperors, queens, etc. He met Mark at the door when he arrived home from work asking for a chess match to be placed on the calendar for after dinner. They're currently sitting next to me and playing a game. Andrew is regaling us with his game knowledge and reminding us of how these pieces look different than the game pieces on our old set which he has informed Mark can be his now. (Funny, I think Mark thought it was his already since it has belonged to him for years...) Apparently the queen on this set has a "pointy, slanty, pointy hat." Thomas received a panda bear puppet. (Wyatt, look away, I think you'll be the proud owner of a new panda bear puppet soon as well.) Grandma had photos on her camera to show Thomas of the pandas they saw on a preserve and he immediately took to the new puppet by "getting" us all with it and carrying on a conversation with it in Thomasese. Panda appears to understand T's language as he held up his end of the conversation with enthusiasm. By the time dinner rolled around it became obvious that panda came with an added-value free gift. He arrived in a small, striped plastic shopping bag and that bag was a fixture on Thomas' arm all evening. He spent the better part of dinner taking panda in and out of that bag, then carrying him around the house as if he was in a kennel. Think Paris Hilton with Tinkerbell on her arm. We left panda and his bag downstairs during baths, but when Andrew got the chess set out to ready for his game with Mark, T remembered that pandas need love too. Panda sat with him while he drank his milk then helped tell daddy goodnight, all from the comfort of his convenient carrying case. Panda then of course joined us for bedtime books, with Thomas clutching him in his bag. When it was time for rocking I suggested that panda go night-night in Thomas' red chair but he had other thoughts. So we rocked, with Thomas holding that red and yellow striped bag over the edge of the chair, crackling and rustling right along with the rhythm of the rocker. I was amused but not concerned because for as cuddly a child as he is, Thomas has never wanted to sleep with anything in his bed except for his beloved blankie. You saw this coming, but tonight marked a turning point for T. He now has a companion worthy of sleeping in his bed. A plastic bag. He wrestled panda from the bag, put his head on him like he's a pillow, then began shrieking when I wouldn't leave the bag in bed too. We may let our kids eat too much high fructose corn syrup and we let the roughhousing on our bed get a little wild sometimes, but come on people, I do have limits. Bedding down with a non-pourous, crackly, handled plastic bag from a foreign country pushes even my boundaries. Thomas has an ear infection and the accompanying diaper rash from the prescribed antibiotics so his mood is a little tenuous. Add to that his fervent desire to assert his "two-ness," and what followed was a showdown. We negotiated as best we could while he was screaming, and I felt like screaming, and in the end agreed that panda would sleep in the rocker. In his bag. If anyone's looking for a very stylish, waterproof handbag, give me a call. I've got one I'm looking to unload. Welcome home PaRon and Grandma. * When told thank you for bringing me a dandelion, "It's my pleasure, mommy." * When offering Thomas the last of the old ice cream treats while he opens a new bag for himself, "Congratulations, Thomas. It's your lucky day, you get the very last of the very old ice cream." * When watching me put on a dress to go to work this morning, "Mommy, you should wear shorts to work." I explained that I couldn't because it wasn't professional. His response, "Would you like for me to call Judy and tell her that you want to wear shorts? I can convince her for you." * While talking about Mother's Day coming on Sunday, "Mommy, Daddy and I don't have a plan for you, but don't worry, I'm making you some junk at school." We had a parenting first last night and I think it's safe to say we've learned a thing or two from the experience. After three flashes of the power, Thomas was up and terrified. As I started upstairs to check on him the electricity went out for good so I was now traversing the stairs in the pitch dark. Wow. Our house is really dark without any lights. By the time I got upstairs my Kansas-girl-instincts were saying, "get ye and your offspring to a basement and go now." Mark apparently has Kansas-girl weather instincts as well because I met him halfway down the stairs as he headed up to get Andrew. This marks the first time we have dragged our kids out of bed in the middle of the night to head to safety during a storm. We've debated it a time or two but have avoided it all costs. Mark runs up and gets a pair of shoes for each of us and my cell phone, on which we can at least pull up the Weather Channel website enough to see that yes, indeed, Douglas County, KS is under a tornado warning for the next 40 minutes. That's all we know, but it's enough. Looks like we're staying put. We're now using my cell phone and one weakly-powered flashlight to entertain the kids and to take our collective mind off the fact that we're under a tornado warning but we don't know where the storm is and we don't have anyway to find out, short of one of us going to sit in the car to listen to the radio, which doesn't seem like a safe idea. Eventually the worst of the storm passes and we're left with regular old May thunderstorms, but still no electricity. Now what to do? The boys weren't very keen on the idea of going back to bed without their myriad lights and acoutrements up and running so we began the process of everyone going to sleep in the basement on the couches. We finally get Andrew to STOP TALKING and Thomas begins to snore. In addition to being very dark in the house without power, it's also very quiet. No hum from anything. Weird. All you can hear is the occassional thunder and rain hitting the windows. It's deathly quiet and then Mark remembers. No power means no sump pump. That's why it's so quiet. Mark gets up to check on the status of the sump pump pit (is there a more technical term for this?) in the storage room, which of course wakes Thomas and starts Andrew talking. He comes back and reports that we need a bucket because if it keeps raining there's going to be water bailing in our immediate future. Fabulous. (Note to self: investigate the cost of a battery backup for our sump pump.) We sat quietly for a few minutes during which time I think it's safe to assume that Mark and I were both offering up small prayers and making deals that we'll try to live up to in the coming weeks. And then, ta da! Power! The lovely noise of the sump pump kicking on and the computer firing up! It was sweeter music to my ears than the performance we had seen at the Lied Center earlier in our evening. We double-checked that the worst was over then took the boys back up to bed. At 3:45 a.m. we were back in our bed and having a little conversation about how since we're both college-educated, longtime Kansas residents, there's very little excuse for the fact that we put ourselves in a RIDICULOUS situation of not knowing where to find a flashlight and having no plan for no electricity. We be so smart. If we can't set a good example, let us at least be a warning to you, our readers! Today we're the proud owners of a new flashlight, weather radio and battery-powered cell phone charger. Battery backups for sump pumps are expensive so we haven't purchased but are in discussions. We only spent $40 total but we probably would have paid three times that just to feel like we had redeemed ourselves! As I write, Mark and Andrew are out repairing our fence. The wind took it down along the entire north side of the yard, breaking the posts off even with the ground. Mark is going to have more help than he needs digging out the old posts, which are set in concrete approximately 11-gillion feet down into the ground, and setting new posts today. Andrew is prattling on about the "80 mile for an hour" winds and we've all learned some important lessons.